I have recently become addicted to top-down knitting. I know, I know, I am late to the party. I started out a fan of bottom-up circular knitting and switched over to seaming when I was expected to design in pieces. I still like a variety of constructions, but I am currently having fun playing with the top-down process and new ways of thinking. Wanting to get the effect of a sleeve cap without sewing it in, working the sleeve last or making short rows, I came up with a new solution -- I think. It's oh-so-possible that folks have done this before me and I haven't noticed. I probably "unvented it" as Elizabeth Zimmermann used to say. This sweater starts with the back shoulders and is worked down for a few inches, then the front shoulders are picked up and worked down, joined in the round, finally picking up the top of the sleeve as I went. The Cable cast on is recommended for the neck shaping. Note: model garment is worked with the larger cable motif omitted on the back. You can chose to work the large motif [rnds 34-104] or continue the small honeycomb background on the center 32 sts. Click below and print each resulting page. For the Body and Main charts, these charts fill two pages. Print both and assemble. Body and Main charts last updated 12/13/13. 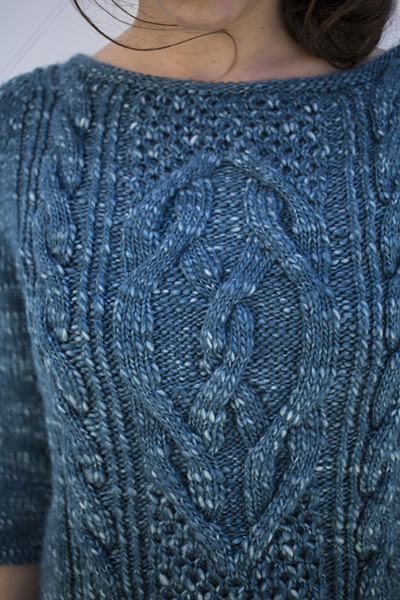 Editor's note: The 12-stitch cables have been reversed in the new charts to accurately reflect the knitted sample. 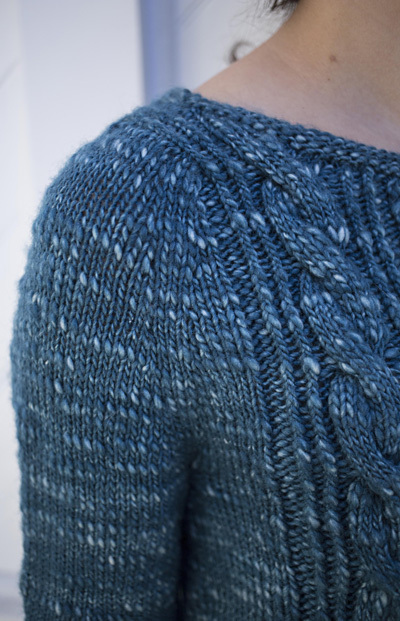 If you're already knitting the sweater, Norah says she thinks these cables look just fine either way, so you don't need to frog unless you must have those twists match the sample exactly. Our apologies for the error. Note: The shaped portion of each front shoulder are worked separately and then joined into one piece when you cast on for the center of the neck. The back shoulders are picked up along the cast on edges of the front shoulders and then joined into one piece when cast on for the center of the neck. Cast on 8[8, 11, 11, 13, 13, 15] sts. Work Left Front chart (Row 1 is a WS row), increasing as shown on chart. 13[13, 16, 16, 18, 18, 20]sts. Work Right Front chart (Row 1 is a WS row), increasing as shown on chart. 13[13, 16, 16, 18, 18, 20]sts. Joining Row [RS]: Working sts as they appear, work Right Front, cast on 54 sts for neck and continue across the Left Front â€“ 80[80, 86, 86, 90, 90, 94] sts. Work 1 WS row, working sts as they appear. With RS facing, pick up 8[8, 11, 11, 13, 13, 15] sts along cast on edge of Left Front shoulder. Work 2 rows following Left Back chart. Note: Row 1 is a WS row. 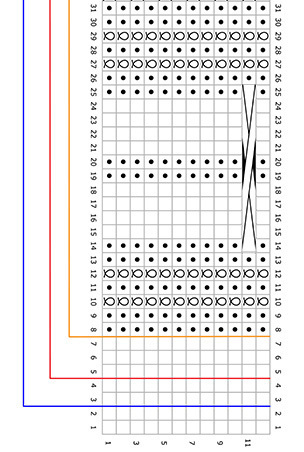 Cast on 6 sts at the beg of the next 3 WS rows and work them, as shown on chart. 26[26, 29, 29, 31, 31, 33] sts. With RS facing, pick 8[8, 11, 11, 13, 13, 16] sts along cast on edge of Right Front shoulder. Work 1 row following Right Back chart (Row 1 is a WS row). 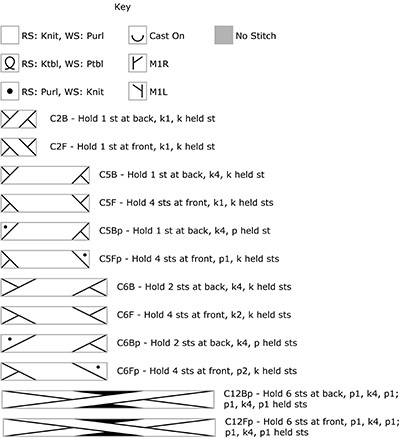 Cast on 6 sts at the beg oÃ¥f the next 3 RS rows and work them, as shown on chart. 26[26, 29, 29, 31, 31, 33] sts. Joining Row [RS]: Following Body Chart beg on Row 1, work Right Back piece, cast on 28 sts for neck continue across the Left Back. 80[80, 86, 86, 90, 90, 94] sts. 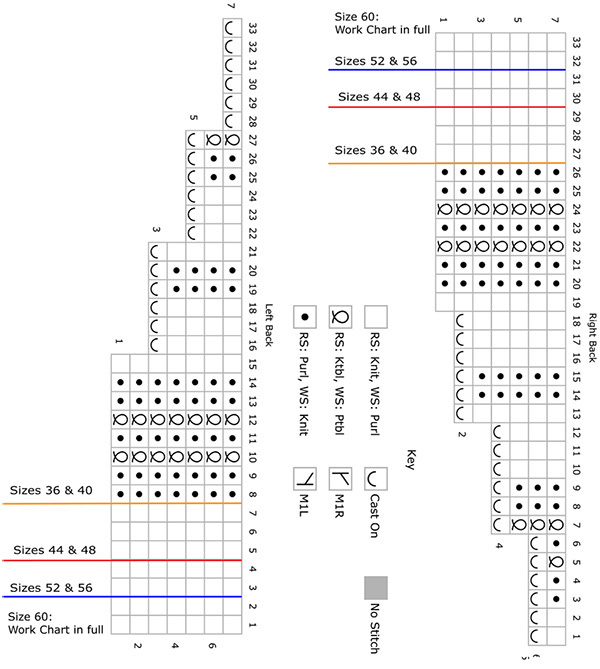 Beg working Body Chart, up to the end of Row 8. Do not break yarn. Joining Round: With yarn attached to Back shoulder work Row 9 of Body Chart across Back, pm, pick up 27 sts along edge, pm, work row 9 of Body Chart across Front, pm, pick up 27 sts along edge, pm for beg/end of rnd. 214[214, 226, 226, 234, 234, 242] sts. Join in the rnd. 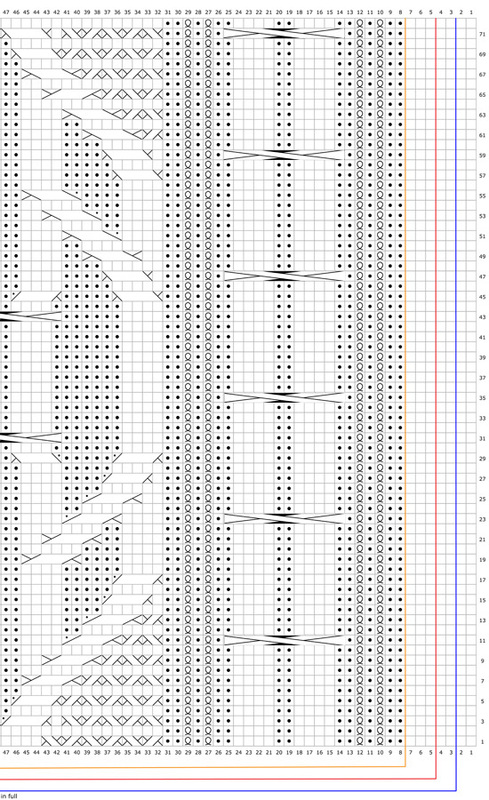 Set-Up Rnd: Work chart over 80[80, 86, 86, 90, 90, 94] sts, sm, knit to next marker, sm) twice. Work this rnd 3[2, 1, 0, 0, 0] more times. Increase Round: (M1, k to first purl st on chart (for some sizes this might be 0 sts), work rest of chart, k to marker, M1, sl marker, k3, M1, knit to 3 sts before next marker, M1, k3) twice. 8 sts increased. Separation Rnd: [K to first purl st on chart, work rest of chart, k to marker, drop marker, slip next 41[45, 48, 59, 63, 71, 77] sts to a spare needle or a string. Cast on 10 sts, knit to next marker, sm] twice. 208[216, 238, 256, 272, 288, 308] sts. 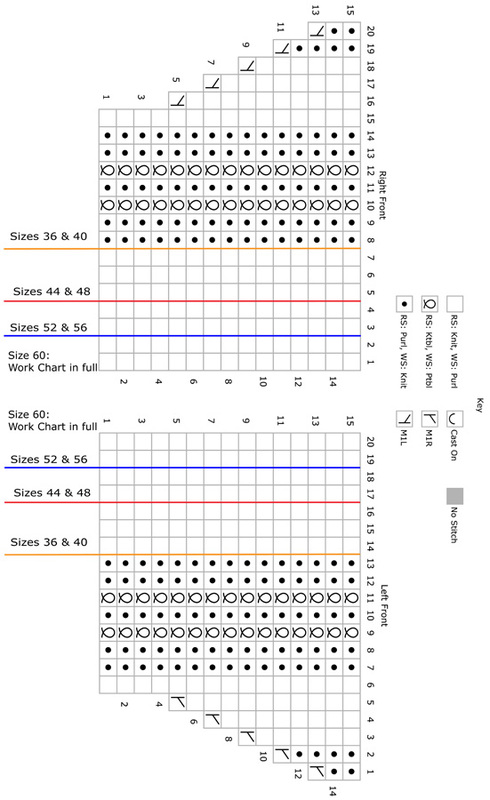 Continue following Main Chart and, when all 72 rows have been worked, transition to Body Chart, working as long as necessary until piece measures 15.5[15.5, 16, 16, 16.5, 16.5, 17] inches from the underarm cast on. 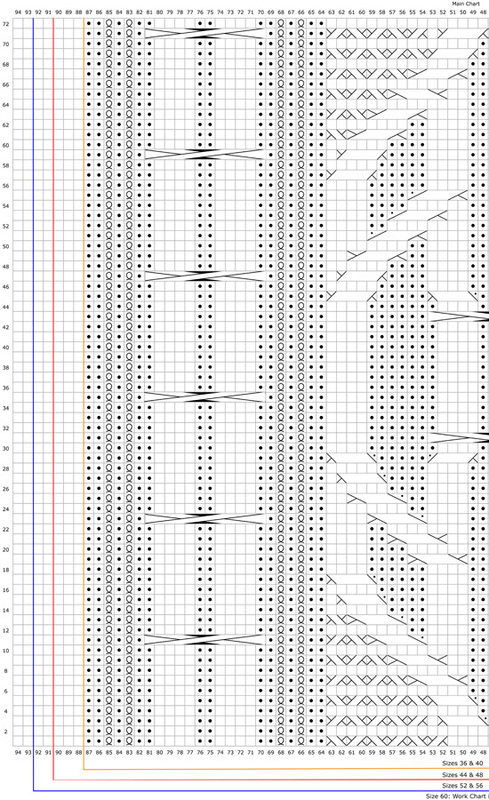 Decrease Round: [Knit to first p st of chart (k2, k2tog) 21 times] twice. 166[175, 196, 214, 230, 246, 266] sts. Slip 41[45, 48, 59, 63, 71, 77] sts of one sleeve onto your working needle (circ needle). Working in st st, cast on 6 sts at the beg of the next 2 rows. 53[57, 60, 71, 75, 83, 89] sts. Work 10[8, 8, 4, 4, 4, 2] rows straight. Repeat the last row every 12[10, 10, 6, 6, 6, 6] rows, 4[5, 5, 9, 9, 10, 11] more times. 43[45, 48, 51, 55, 61, 65]sts. Work straight in st st until sleeve measures 11.5 inches from the underarm, ending with a WS row. BO in purl on the RS. Sew sleeve seam and underarm seam. Slip 41[45, 48, 59, 63, 71, 77] sts of one sleeve onto dpns. Starting in center of cast on sts from the body, pick up 5 sts, knit held sts, pick up 5 sts across remaining cast on sts. 51[55, 58, 69, 73, 81, 87] sts. Join in the rnd. Work 11[9, 9, 5, 5, 5, 3]rnds even. Decrease Round: K2, k2tog, k to last 4 sts, ssk, k2. Repeat the last round every 12[10, 10, 6, 6, 6, 6] rnds, 4[5, 5, 9, 9, 10, 11] times more. 41[43, 46, 49, 53, 59, 63]sts. Work straight in knit until sleeve measures 11.5 inches from the underarm. Purl 2 rnds. BO in purl. Starting at the left shoulder, with RS facing, pick up 100 sts around the neck. Purl 3 rnds. BO in purl. 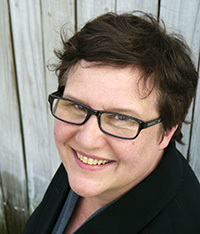 Norah Gaughan is the full time design director at Berroco. The author of Knitting Nature, and Comfort Knitting & Crochet: Babies & Toddlers as well as co-author of Comfort Knitting & Crochet: Afghans, she's just completed her 14th eponymous volume for Berroco, Norah Gaughan vol 14. You'll be able to see items from this booklet in January 2014.